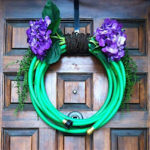 Summer wreaths are perfect to display once the weather starts turning warmer. Although you can find a lot of flowers in the summer, there is no flower that really represent the sunny season more than the sunflower. Even the name of it sounds like warm weather! The sunflower is not only beautiful due to its vibrant colors, but it is also impressive because of its size. Other than the beauty of them, sunflower wreaths also are very important for us, since they provide nutritious sunflower oil, sunflower seeds and lately they are also cultivated for biofuel. If you are searching for inspiration for summer wreaths, use this impressive flower as a guide and make a vibrant, fun sunflower wreath by following our directions. You can find the link to the video on Summer Wreaths: How to make a Sunflower Wreath here. Cut the yellow deco mesh into 10 inch squares, so you will need about 20 to 30 10×10 inch yellow square pieces, which will become the sunflower petals. 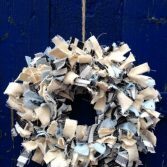 Don’t worry if you can’t cut them exactly, having slightly different sizes will give your wreath an airier feel. Take one square piece and hold it from two opposite corners. Stretch it a little bit. Then, pinch it together from the other two opposite corners by making small pleats. Hold it together and without letting it go, take a second piece and pinch it together like the first one. You will end up with something that looks like an “x” made out of the two pieces of mesh. Tie these two pieces onto the outer line of your wire wreath form using the preinstalled tie by twisting it. Continue in the same way until you have covered all the outer line of the wreath form. Flatten any excess ties and arrange the deco mesh a little so it looks fluffier. Continue in the same way with the second inner line of your wreath form. When you are done with the yellow deco mesh, it’s time to make the center of your sunflower wreath. 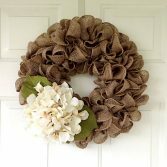 To do that, just take your brown deco paper mesh and tie one end of it to a center tie of your wreath form. Leave some excess paper mesh to have a fuller center and tie it to the opposite tie. Now, return the brown paper mesh and tie it next to the first tie you used (it’s kind of a weaving process to fill the center). Continue tying the brown mesh by moving from one tie to the next, always creating a fluffy puff of mesh. When you are happy with the center, cut off any excess and hide the end by tucking it into the mesh. If you want, you can add a stem and some “leafs” using the lime green paper deco mesh. To do that, flip your wreath gently over and use some of the outer line ties. Cut a 30 inch long piece of lime green paper mesh. Choose a corner and start rolling it diagonally (on the long side) forming the stem. 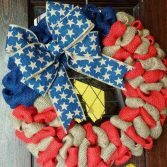 Attach it to your wreath using the outer tie. Make a couple of leafs using the same method as you used form making the petals. Another thing you can do is add some larger, lime green deco mesh leafs behind the yellow petals. To make them, cut a few 15-16 inch pieces of your lime green deco mesh. Using the same technique as for the yellow petals, pinch two pieces together and attach them to the outer ties, behind the yellow petals. 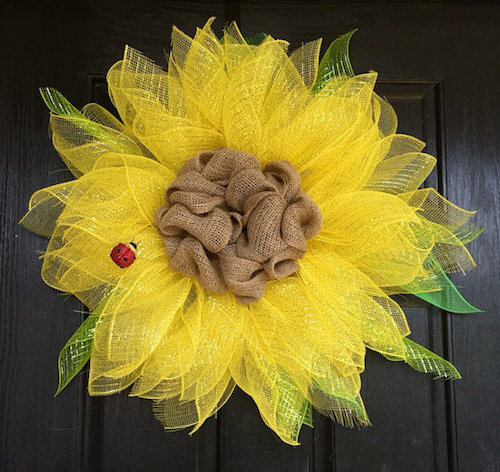 If you’d like to use a hot glue gun to attach craft ladybug(s) to your sunflower wreath! You can’t help but think about beaches, sun and blue skies when thinking about summer. 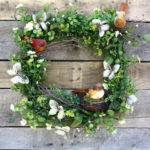 So use these themes as inspiration to make your summer wreaths. Just think about your favorite feature of the summer and work with it. 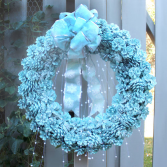 Hanging your wreath on your door is the perfect way to decorate your entrance. It is the first thing a visitor will notice and makes for a wonderful discussion starter. To make a sunflower wreath you don’t require that much time or difficult to find supplies. 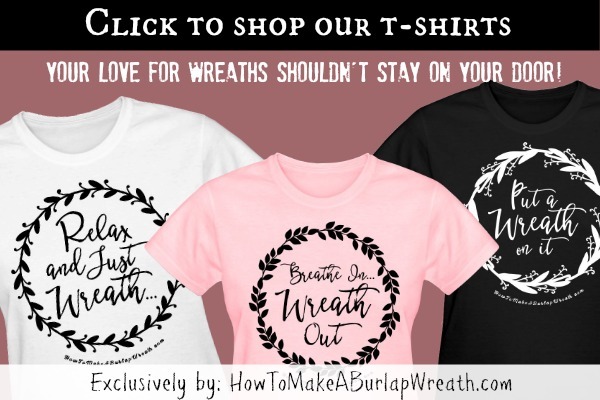 Just follow our instructions and you will have wonderful summer wreaths in no time. 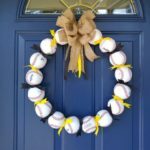 Instead of trying to tie a bow or loop and secure it to your wreath, you can purchase a practical wreath hanger to hang your wreath easily and securely. 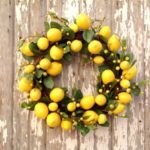 So don’t lose any more time, gather the wreath making supplies and get to work making this wreath right on time for summer. Other than making this wonderful sunflower wreath, you can use the technique to make other flowery summer wreaths, too. 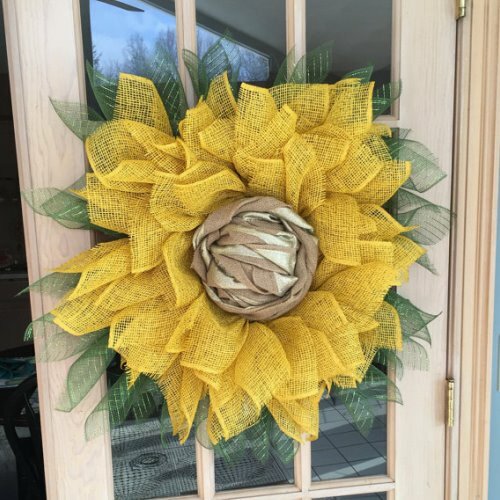 Just use different colors of paper deco mesh or even burlap to make a wonderful variety of your favorite summer flowers to hang on your door or in a room inside your house. Think about crafting a romantic pink or white daisy and don’t hesitate to add some fun elements, like some bee or butterfly figures for a playful twist. For more summer wreath ideas visit our Summer wreath tutorials here. I love that pink wreath! I would have never thought to make the sunflower wreath in fun, bright colors. Thanks for sharing at Merry Monday this week!